I have been wanting to sew up this Chic Cowl Neck Dress FOREVER! I love it! I want to make one to wear with a comfy long sleeve shirt, my skinny jeans and boots. Unfortunately, I have had no time to sew. Throw in a pulled back muscle and a cranky sewing machine and you have absolutely no sewing going on. BUT, I plan on taking my machine in for a much needed tune-up the first week of January and start the year out with some sewing ~ Yippee!! Indygo Junction very kindly sent 2 of each of my favorite patterns. One for me to try out and one for you. How awesome is that!! I thought I’d better share these with you now, instead of waiting until my back, my sewing machine and time are all better. Plus, I am still searching for the perfect fabric! I’m thinking navy, eggplant, brown or a dark red type of fabric. Any suggestions? Anyway, If you would like to win one of the lovely patterns, please leave a comment. I will pick 3 winners, sometime this weekend, to win ONE of these three patterns. Tell me in the comments which pattern you would like. International entries are welcome. If you win, and make the pattern, I’ll share it here on my blog, if you like. Winners are: Mandy Whalen — Cowl Neck Shift, Raesha — Trench Topper , Elsa and Linda win the Zips! Thank you so much everyone for playing!! Too cool – love all of the items up for give-away! Ohhh – some challenges in my sewing would be great to start out the new year. I can’t remember when I last sewed some clothing! 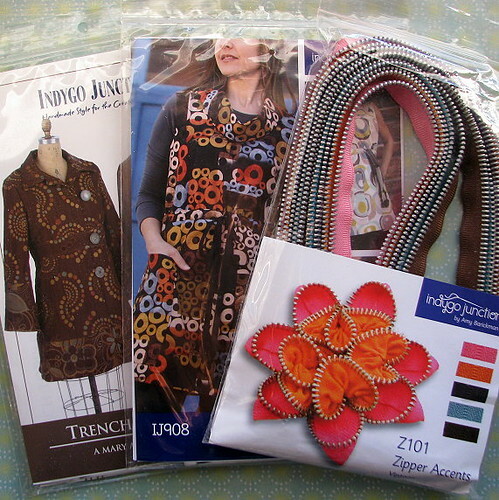 After participating in your brooch swap, I am drawn to the zipper pattern, My Garden Zips. I haven’t made anything with just zippers yet and it sounds like fun. Thanks for the giveaway. Happy Holidays to you and your family. Really like that zipper flower ~ thanks so much for sharing your bounty with us! What a great giveaway!! I love Indygo Junction:) If I win I would love any one of these patterns. I love all of them, but my choice would be between the cowl neck shift and my zips. I think I would have to choose the zips! Thanks for the giveaway. I love, love, love that zipper brooch. Gorgeous and so creative. The patterns are cute. I especially like the zipper pattern. Love all the patterns but especially the Zipper Accents! Looks like creative fun. Hope your back is feeling better soon. How sweet that you are able to give them away. Merry Christmas. I am not one who wears dresses, so the jacket pattern would be more to my liking. It looks fun. ooh, i think i would like the zips. my daughter’s 28th birthday is next month and she totally loves the look of the zippers. it would make a great gift. Love the cowl neck shift. Think that would be a great summer outfit to make maybe with the short sleeves. What a great idea! i would love to win all so hard to pick just one.The zipper flowers would be fun to learn how to make them.Thanks for chance to win. VERY tough choice, but I would have to say the trench topper! Love, love, love Indigo Junction, I have many, many of their patterns, but I sure would love one more! Would love to try the zipper pattern. Looks like lots of fun! Pick Me! Pick me! I love your patterns! I have to say the Chick Cowl Neck Shift would be my first pick. I would love to try the neck shift – it looks perfect for the winter weather here in Germany. And I might have just the right fabric in stash for it. Thanks for the give away. What rock have I been under? Never even heard of this company before and I love sewing. Count me in for the trench coat. So glad I found your blog.